This is now my third hexie quilt. My first one was out of flannel and I joined the hexies directly to each other sewing Y seams. My second hexie quilt was made by cutting the hexies in half and sewing rows (not yet posted). For this my third hexie quilt, I am using the star pattern. I planned the size of the filler triangles by drawing my hexie on paper and then drawing a line from two sides to a point (forming a triangle). I was then able to determine the size of the strip to cut. I allowed for seam allowances and added 1/4″. 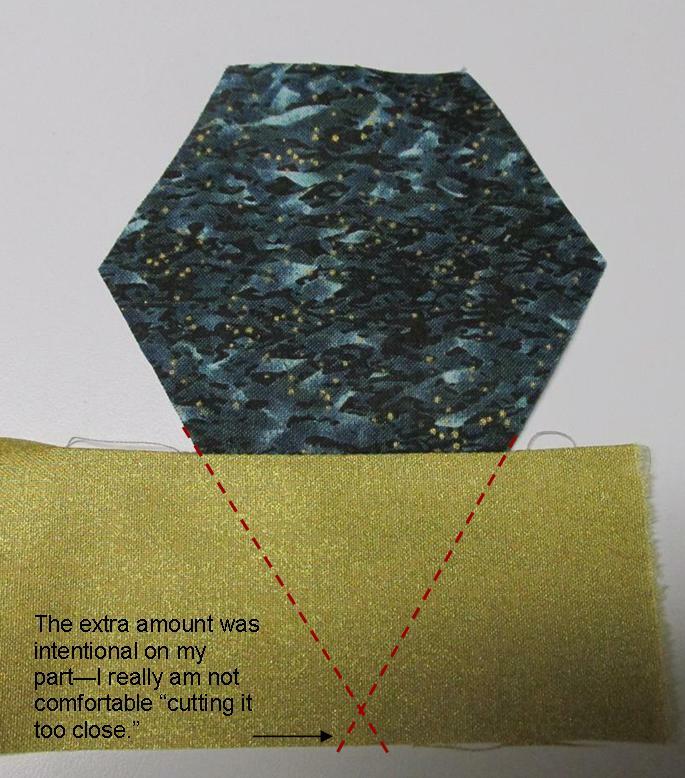 I did not want to cut triangles and sew those to the hexie sides – lots more work and more inaccuracy potential. Using scrap fabric, I made a test piece so I could see how the points would match. This will not be fast sewing for me! I also marked my seam to make sure I had 1/4″ seams. 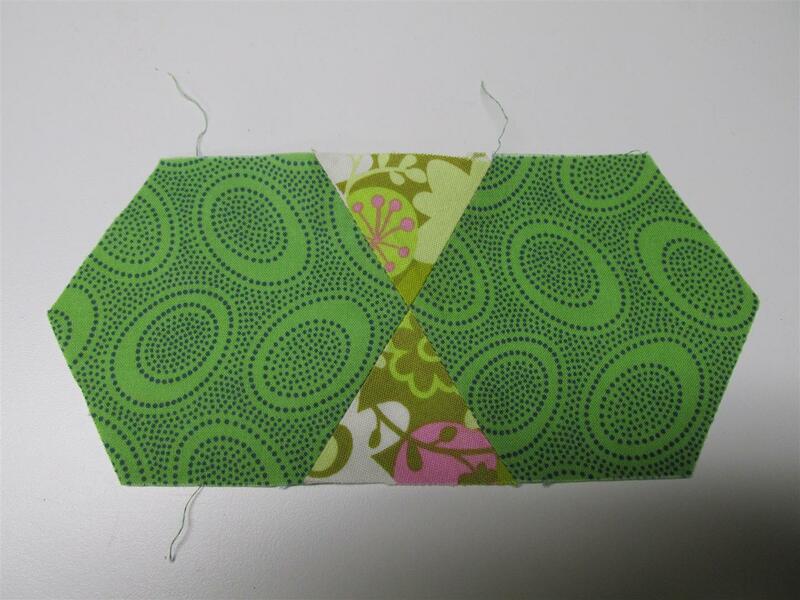 I then cut the strips from my solid and strip sewed one side of the hexies to it. Next, I pressed the seams open, trimmed and repeated the process for the opposite side of the hexie. 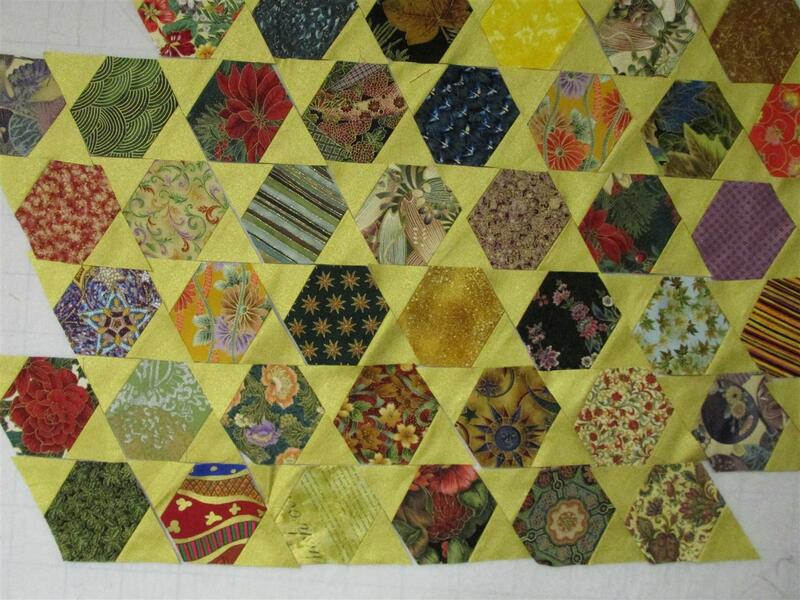 I am now putting all the sewn pieces (hexies with triangles on two sides) on the design board. I have about four of each fabric pattern and want to be sure they are all spread out before sewing together. 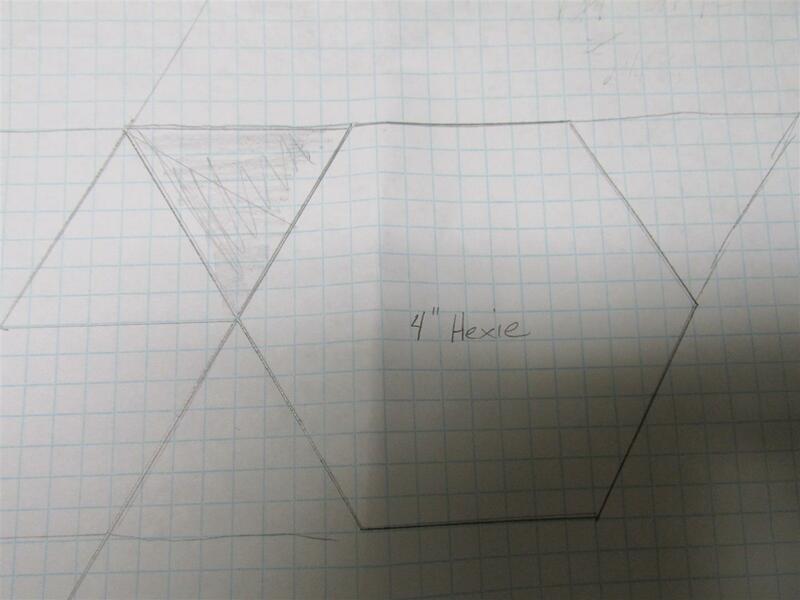 I also want to be sure I have enough hexies cut to make the size I want. And no, I did not figure that out mathematically ahead of time. Sometimes I just tend to roll from the seat of my pants. I’m not recommending that, but I just enjoy the process more if I don’t need to do a bunch of math! Note that the hexies look skewed on the design wall – that is because two of the sides have seams sewn and the others do not. There probably won’t be a lot of progress on this any time soon as I have lots of other things I need to work on first, but it’s ready to go whenever the mood strikes. I hope for those of you who would like to do one of these that this info helps. Is there yet another method of putting hexies together other than appliqueing them? I’d love to know!